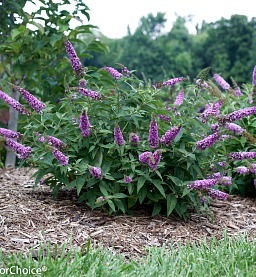 Pink Micro Chip Buddleia Butterfly Bush is part of the Lo & Behold Series which is a seedless butterfly bush. The Pink Micro Chip Buddleia is a butterfly bush that will take your garden throughout the summer months with big bursts of orchid pink blooms attracting butterflies, hummingbirds and bees to your gardening sanctuary. A strong re-blooming perennial plant even without deadheading, this drought tolerant plant grows only 18 to 24 inches tall and spreads 18 to 24 inches wide. Easy to grow flowering shrub does best in full sun and can be grown in containers, in the ground as a garden plant for edging or in a butterfly garden. Plant in multiples for strong garden focal points. Great companion plants for the Lo & Behold Series are other Micro Chip varieties plus salvia, Russian sage, pineapple sage and daylilies. Also try the Blue Chip Jr Dwarf Buddleia. Plants shipping to AZ and CA will be bare rooted before being prepped for shipping.